For me having an auditory learner really makes poetry study easy. Whether poetry is your thing or not, here are suggestions for How to Inspire Your Child With Poetry. Inspire your child with poetry by reading together. Children must hear poetry read. So don’t just hand them a book unless they are already interested or have already been exposed to poetry. I mean don’t expect them to be inspired by just saying “read this”. Short Cut: If you can’t add one more thing to your curriculum look for poetry CD’s at your local library and put them on during trips and car rides. You’ll be surprised how much a whimsical and fun poetry reading will inspire your kids. Find a good poetry book and incorporate it into your language arts curriculum. One book I can recommend is A Child’s Introduction to Poetry by Michael Driscoll. You can read my full review on The Curriculum Choice . We had a fabulous time listening to this book. Since it comes with a CD we can hear how each poem should be read and because the book also gives instruction with each poetry form, we can also learn about the poems and then write some ourselves. 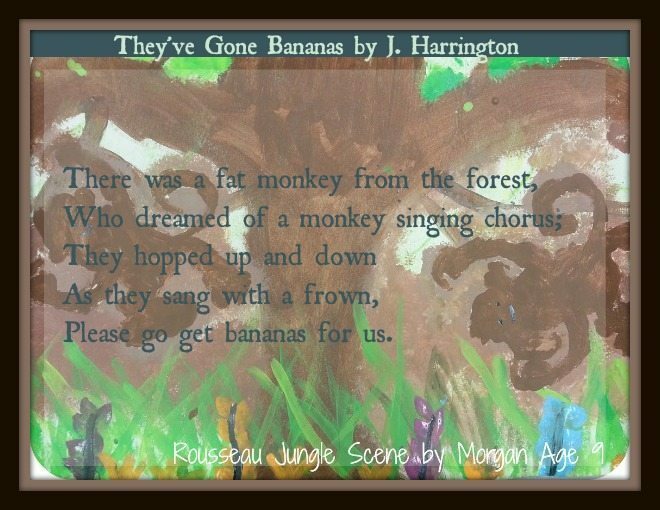 The overall tone of the book really appeals to children and even in presenting the most serious of poems it does a fabulous job relaying them to a child’s heart. 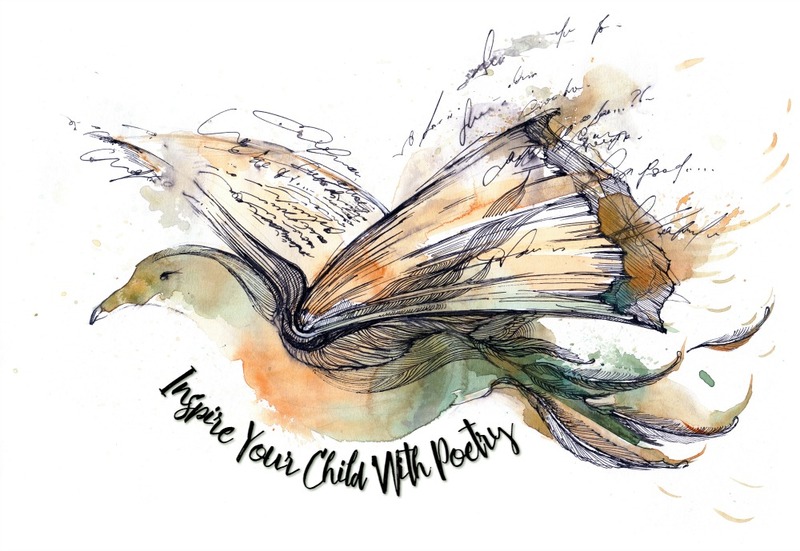 Inspire your child with poetry by writing together. Break down the structure and pattern of a poem type you enjoy. To make my point, I will use the example of the Limerick because of it’s simple pattern and humorous nature. For a limerick the pattern is very simple. There are 5 lines. The first and second lines rhyme, the third and fourth lines rhyme, and the fifth line rhymes with the first and second. Encourage your child to write their own poem. Sometimes kids will need guidance, others will want to go with it their own way. We laughed a lot while he experimented with possible word combinations. I wrote the lines on the board as the poem developed. For example, he started with the first line and then came up with the third and fourth lines. We added the second and then fifth. All the time we improved as we went. Don’t try to force it, just giving it time and allowing verbal brainstorming really helps. Once, you’ve modeled a type of poetry, your child will be able to begin writing them on his own. It’s up to you to guide the experience positively. All of writing is a process. So, you can’t expect to get a poem written necessarily in a short session. Maybe it will happen that way. But maybe it’s good to write and return over a period of time. This is also a skill your child can learn. Only after the lines are completely finalized would I begin analyzing spelling and punctuation. Analyzing grammar too early in the process may stifle your child’s creativity and enthusiasm. For example, once we knew how our limerick should sound, only then I had my child could write it properly. Inspire your child with poetry through repetition and exposure. Add some poetry to your homeschool program every year. All of learning takes time, so you can’t expect your child to be an expert right off. Continue to add a little poetry through out you child’s education. If you really want them to be inspired, expose them regularly to quality, not twaddle, poetry selections. Consider using poetry for copy work or memorization. I am always looking for good copy work selections. Poetry selections seem like great choices to me. With poetry pick something engaging for your child, perhaps a line that seems important. Make sure it’s appropriate in length. You can break it down into parts, a line or two each day. Quality content – is it teaching them something you want them to emulate, remember, or ponder? Applicability – does it go along with something they are learning elsewhere or can relate to their life somehow? In addition, because poetry usually has rhythm and rhyme they also make excellent selections for memorization! Try adding an illustration to a poem or use an illustration to inspire one. An interesting drawing or poignant photograph can inspire poetry. Likewise, the poem above, a Haiku, begged an illustration. 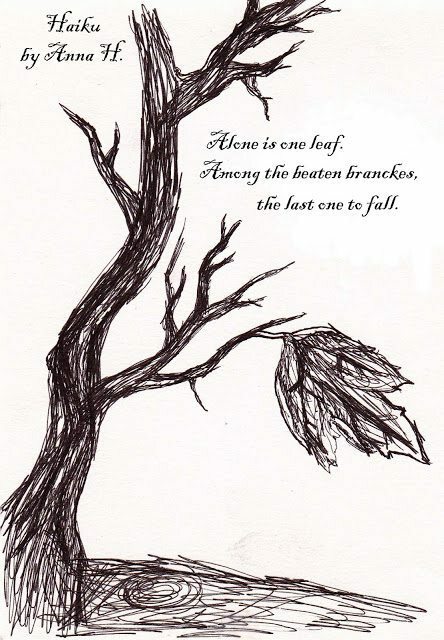 My daughter drew this tree to go with her Haiku, she was in about 8th grade. I love how she emphasizes the One Leaf and how she uses perspective in her drawing. Isn’t it a wonderful take on the meaning too? The Haiku traditionally focuses on imagery with an emphasis on nature. This one certainly accomplishes that. 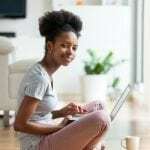 Do you remember to add poetry selections to your homeschool? Share your method, leave a comment!